Version 7.0.x.32 of GTViewer is available. - NEW - #5156 - Sorting of Query Result records on all columns and support for clicking on column headers for sorting. - FIX - #5152 - Adjustments to Style Manager to prevent style gaps at boundary threshold values. Version 7.0.x.26 of the PGTV Control is available. - FIX - #5028 - Using the filter string mode for methods using the display string, elements without data could cause problems. - FIX - #5037 - Range computation for Group elements was not correct. - FIX - #5054 - Modifed ASCII Read Function to account for end of file. Modified to reflect change made in 5052. Does not directly affect device platform because it only supports .gtx file. - FIX - #5059 - Multiple Ascii datasets would sometimes get corrupted position pointers when opening .gtx file. - NEW - #5063 - Enabled Property is now supported. - FIX - #263 - The element picklist was corrupted after the use of a Feature Delete. - FIX - #262 - GetFeatureInfo was not handling Data Only Elements correctly when coordinate values were requested. Version 7.0.x.65 of the GTViewer .NET Control is available. - FIX - #5127 - Current locale not being set in GTV_Lib.dll. - FIX - #5128 - ASCII to Element was not working for characters greater than 127. Used when reading .gts files. - FIX - #5121 - Problems with Unicode only mapped TrueType fonts (such as Wingdings) where the character code is greater than 127. - FIX - #5117 - Text characters in a .gts file greater than ASCII code 127 were not getting read correctly. - FIX - #5098 - Style Map was not being reset after loading a .gts file. - FIX - #5083 - GetDisplayFilterString was not taking the category display status into account. - FIX - #5084 - Category Display Status now supported by GetDisplayFilterString and SetDisplayFilterByFilterString. - NEW - #5064 - Added GetDisplayFilterString method. - NEW - #5065 - The SetDisplayFilterByFilterString method will now support *:*.0 and *. *.1 for global changes. - CHG - #5066 - Darkened the control Enabled=false color. - FIX - #5052 - Reading to the end of the data.txt and data.tab was not recognized as the end of the file for ASCII files (when using a .gts or .gtm file). - FIX - #5057 - Multiple Ascii datasets would sometimes get corrupt position pointers when opening .gtx file. - NEW - #5061 - Enabled Property is now supported. - CHG - #5033 - Persistent Highlight has been changed from Document level to View level. Each view now has its own persistent highlighting. - FIX - #5034 - Weighted Persistent Highlighted was not working correctly. - FIX - #5035 - Range computation for Group elements was not correct. - NEW - #5007 - Dynamic Highlight Functionality added. - FIX - #5012 - All Data retrieval methods were not working propertly with .gtm files. - CHG - #5013 - All Single Key data support has been removed. - FIX - #5017 - Exporting of Element to Ascii Format did not work with embedded data. - FIX - #5026 - Using the filter string mode for methods using the display string, elements without data could cause problems. - FIX - #5028 - Right Mouse click did not press Finish Softbutton for Freehand, Rectangle, Circle, and Ellipse. - FIX - #5029 - Delete button on Keyboard was not linked to Delete Softbutton for Delete Redline mode. - FIX - #5030 - Adding new elements after a .gts file was loading would overwrite elements from previous session. - NEW - #5005 - Added SetDisplayFilters method. - NEW - #5006 - Added GetFeaturesInRange method. - NEW - #261 - The AcceptKeyboardInput property has been added. Pocket GTViewer version 7.0.x.12 is now available. 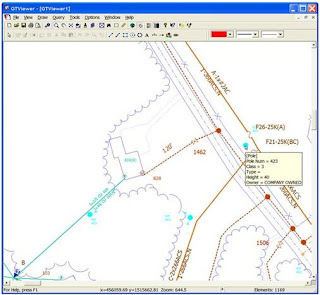 This version requires the Trimble GPS components version 2.3. - FIX - #5129 - Problems with TrueType symbol fonts. Introduced with 5126. - FIX - #5126 - Problem converting multibyte characters to unicode for text and symbol element display. - FIX - PGTV #1003 - Fix for certain character sets (non-English). - FIX - PGTV #1001 - Complex Shapes (Type 3, Extended Style 2) with a style rule containing only a Color and no border color would draw the complex shape's border with the element's shape border color. This has been changed to use the color in the style rule if the style rules defines only a color and no border color. - NEW - PGTV #1002 - Upgraded to PFTools 2.3. Requires upgraded PFTools installed on device when using GPS. - ssfAnt_LogSuperCorrect is no longer supported. - intComSat_ActivationCode is no longer supported.